What do census records, voter’s registrations, and court dockets have in common? They all are sources exempt from the Privacy Act that can be referenced when searching for our ancestor’s vital records: birth, marriage, divorce and death. Oh, and let’s not forget criminal records and professional and business licenses. They too are exempt from the Privacy Act. In the name of privacy there are many access restrictions imposed by states, but the persistent family researcher may still uncover their ancestor’s vital records. 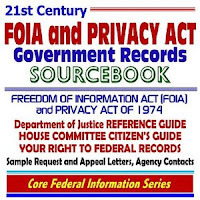 The article Genealogy Research vs. Privacy Restrictions posted by Archives.com on 31 Jan 2012 gives the researcher a few options for ferreting our ancestor’s vital records when the Privacy Act gets in our way. 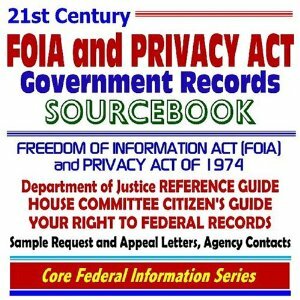 The Freedom of Information Act (FOIA) policies of some federal and state repositories are often implemented in such a way that the “Freedom” part is buried in red tape. Privacy Act restrictions vary state to state and are implemented in the most creative ways. Restrictions of seventy five years seem to be favored by many states’ birth certificate access; as is fifty years for withholding death records. And whereas some state and federal repositories have 50 or 75 year restrictions, others impose a 62 wait (i.e. Veteran’s service records). A few, like the Social Security FOIA now enforces a 100 year from birthdate (regardless of death date) restriction. If your ancestor had a 1912 birthdate, you can receive an unaltered social security documents this year. Later social security applications will be under the scrutiny of the agent who liberally uses a redaction tool to eliminate the useful information the family researcher is seeking. Yet, privacy act implementations and restrictions should not prevent the family researcher from locating birth, marriage and death records. Plus, know that a few open states do exist. And others, like Pennsylvania, are becoming more genealogy-friendly, where access to birth, marriage divorce and death records is less of an obstacle course. Did Your Ancestor Have Tuberculosis? It’s not easy to imagine that our ancestor’s travelled a distance for health reasons. But tuberculosis was accompanied with the fear of rapid spreading. Isolation from the general public was necessary. To understand your ancestor’s removal from the household, you may need to understand the process of treating tuberculosis in the early 1900’s. The website continues to explain the disappearance of our ancestors from the home. “Diagnosis of tuberculosis took six to eight weeks and because there were no medications to treat the disease, patients confined to the sanatorium spent months or years away from home. Reinfection was common and often necessitated a return to the hospital. Genetic genealogy was not of importance before 2000 but researchers may find basic genealogical information such as: next of kin (emergency contact"), home address, occupation, age, etc. You may find additional information on his death certificate or in cemetery/funeral records. By narrowing a date of hospital admission, you may be able to follow progress your ancestor's progress in the local (home)newspaper, especially if he lived in a small community. Early Missouri death certificates may note place of death as the Missouri State Tuberculosis Sanatorium in Mt. Vernon. Lawrence County. However this institution originally built for tuberculosis patients no longer exists, even though many of records still survive. Today, associated with the University of Missouri School Medicine, the Sanatorium operates as the "Missouri State Rehabilitation Hospital" housing veterans and providing services. f. 943-994 Employment applications for positions at the State Sanatorium, Mt. Vernon, together with letters of recommendation. Folder 943 contains a list of employees. Visit the Missouri Digital Heritage website to see additional photos of the Sanitorium. Have you read your ancestor's personal letters? Deciphering some of these letters may depend on your knowledge of local speech patterns, dialect or accents. Up until today, I did not know bane meant anything other than poison. I looked it up in the Webster’s Dictionary and it also gave “woe” and “harm” as definitions and synonyms. However, none of these words reconciled the meaning of the paragraph above that was transcribed in the Itawamba Settlers, Vol 31, No 4. (Note: I am a member of the Itawamba Historical Society. Itawamba is located in Mississippi and the society produces an informative newsletter, Itawamba Settlers). Here are a few tips to ease our experience of reading, defining and deciphering "new word in order to gain full comprehension of our ancestor's experiences. We are accustomed to homonyms, so the occasional here vs. hear does not throw the reader for loop. We rarely take note. However, if you are having trouble reading passages try pronouncing each letter. Usually a word will form. Try it with the paragraph above. Sometimes we have to reread a sentence for clarification, especially if punctuation is missing and there are 2-3 run-on thoughts and sentences without a discernible pause. 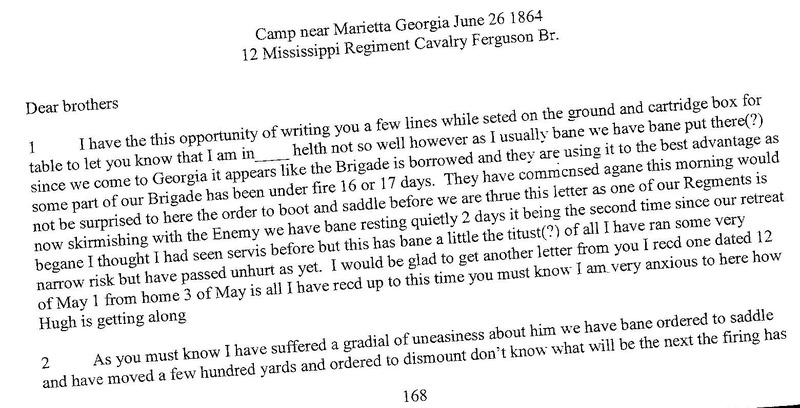 Oh, I’m sure we can forgive the soldier on the battlefield if he didn’t take time to proof his letters. Of course the periods may have been so lightly placed that they are no longer visible. Well, that doesn’t explain the lack of capitalizing words to initiate a new sentence or thought. But we can do it for him. With pencil (and eraser) in hand capitalize letters, let's put in the punctuation to make concise sentences . By reading outloud and varying inflexion this can easily be accomplished. Remember we are going for a clear thought, not necessarily excellent grammar. I suggest we make a note of the correct spelling. This will ease the flow of the next read of this paragraph. Voicing outloud aided me in determining “titust” was tightest. But it was the word bane, used four times in this paragraph and over a dozen in the entire letter that stumped me. Surely those accustomed to Southern dialect deciphered it easier. But not until I tried it in a regional twang (as good of a Southern accent a Kansan could do), did I claim victory. (Well I knew he wasn’t referring to poison, woe or harm). 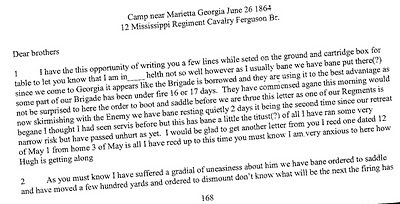 In analyzing personal letters it will behoove the reader to loosely apply the “elements of literature.” Analyzing setting, speaker, and speech or diction will assist the reader in applying the correct meaning to a passage. “…I thought I had seen servis [military service?] before, but this has bane [been] a little the titust [tightest] of all. I’m left to wonder if the original is clearer. Would I have transcribed these sentences with the same outcome? Viewing the original will answer some of the question, but this is what I have right now. And, we are grateful that the Itawamba Settlers printed this transcription of the Beachum Papers and Letters from their collection. 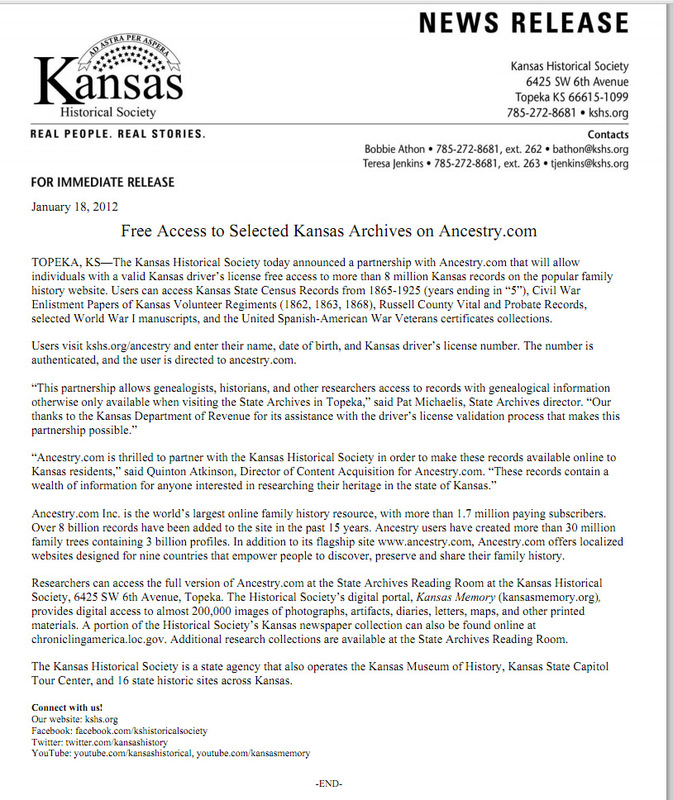 The Kansas Historical Society announced its Ancestry.com partnership for Kansas family researchers, genealogists and historians. 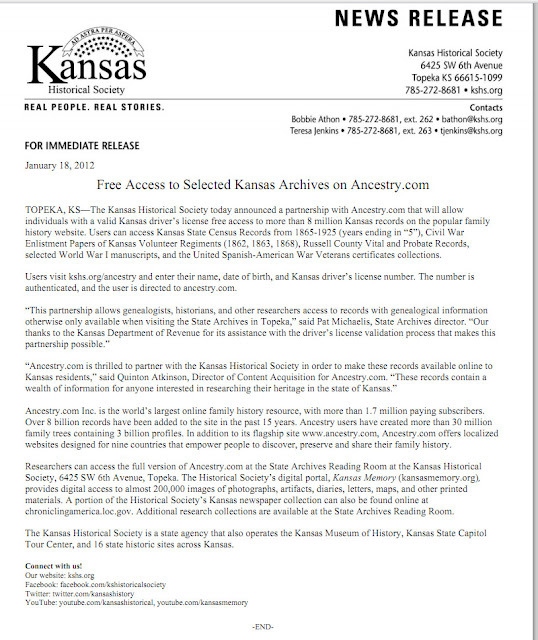 The News Release on 19 Jan 2012 states that selected Kansas Archives on Ancestry.com offers remote access via the internet. Users visit kshs.org/ancestry and enter their name, date of birth, and Kansas driver’s license number (for access from home). The number is authenticated, and the user is directed to ancestry.com. World War I, Kansas Veterans, Manuscript Collection no. 49 Letters, military documents, photographs, and other documents providing information on Kansas soldiers in World War I, primarily members of the 35th and 89th Divisions. Items solicited from each veteran or his family included letters, especially from overseas; a photograph; and a brief biography containing date and place of birth, residence, parents' names, occupation, and names of spouse and children. The amount of information in each file varies greatly. Rule One: Indexing is Not Transcribing Scenario: Why were the father and children of an Ireland born ancestors classified as mulattos? Wait...the last child is “white.” How could this be? It’s not fair. My client, a professional writer, was looking forward to uncovering the mystery of her racial controversary. Her initial research verified that her Irish born ancestors was a mulatto, so were his children. She hired a3Genealogy to get to the root of this. Ouch! We have to tell her, that the index for her 1870 family, the premise of her story, was incorrectly “transcribed” by the indexer. The Errors: The census indexer who read page 1, mistakenly determined the “W” as “M” under the “Race” column. It could happen! Have you seen the handwriting on those census records? Most would ask why would the last child be white. In this case, it is because, that child was listed on the top of the next census page. Perhaps a new indexer was assigned or enough time lapsed to forget the previous page. Not sure, but these types of indexing errors are not rare. As Ancestry.com is neither the author nor the compiler of the data in its indexes, we cannot assume responsibility for the accuracy of this information. Please exercise caution when judging the accuracy of data in the U.S. Public Records Index. Some addresses and telephone numbers are invalid and birthdates may be inaccurate as well. This “Important Note” should be applied to all indexes, encouraging researchers to go to the original source, or at least obtain authentic unedited clear copies. Be sure to review any available image to assess quality of the source image or errors inadvertently made. Remember there are other sites that may have clear copies, or different index results. Try Familysearch.org, Heritage Quest, Archives.com, Fold3 or even the local genealogy sites. To my client: a book can still be written on the racial controversary but of course it would definitely be fictionalized. But with twists, turns and a bit of drama and love, it could be a Bestseller. One is from the record summary page, which shows the indexed information plus a thumbnail image of the record; the other is from the census record image itself (if applicable; some records like the Social Security Death Index don’t have images). Regardless of where you add information from, we keep the original indexed information and add updates as alternate information. This means that if an update is incorrect, the original information is not lost. The ancestry.com Census Indexes and Finding Aids article gives a bit of the history of the accuracy of indexing. One brother shot the other! As genealogists we try to take a peek into the past and uncover our ancestor’s lives: who they were, what they did, when they had life changing experiences, and where they experienced them. The who, what, when and where aspects tells a story. But, the “who” is the hardest to capture since each ancestor had individual unique experiences, personalities and foibles. The “who” is not the grouping of a surname, but reveals an individual’s personality, a persistent trait, a unique characteristic. Why Would a Sibling Shoot? As family researchers we often lump the family in groups - “They were “religious people.” Were they? All of them? We can take a look at our own sibling interactions to understand the gamut of possibilities. I had 3 brothers, none of them are alike. Their personalities were more disparate than Kansas seasons. Sometimes I wonder if siblings were raised under the same household. Ask about one event, you get three totally different experiences. Only the place and time - the where and when - seems to be in accord. The what happened is from the perspective of the who tells it, which means it would take an experienced excavator to uncover the truth. Our ancestors were no different. We can easily identify the affluent sibling, the entrepreneur or educated one. There’s the sibling that has a trail of court records and those who have written self-promoting manifestos allowing family researchers to more easily assess a personality type because his “truth” can be either supported or in conflict with the documents. Recently I read a bio that suggested a completed college degree. It even stated “the class of …” But this self-promotion could not be supported by the school or the transcripts on record. Yes, he attended the college and had many completed hours, but no degree requirement was met. We might look to the family for answers. What made him self-promote? Did the family value education and he failed to obtain his degree? Did siblings achieve what he did not have? Perhaps he habitually stretched the truth, or sacrificed his integrity for status or career growth. Our genealogy records don’t always offer the reason, but it does allow us to take note; to see if there is a pattern. With family research and closer reviews of the sibling dynamics, I’m left with wondering which one was the bully or perhaps the aloof one or controlling one. There always seems to be a selfish or narcissistic one. And it never fails, one is always a persistent victim. Even after reading and studying birth order characteristics, we can not necessarily define a personality sets, because there is no set answer when defining the “who,” not even with a Myers Briggs analysis. Just like today, a visit from a sibling does not mean the relationship is one bound by love. Perhaps it’s by obligation. Perhaps it was a strained visit. Think of your last family gathering. Our genealogical records do not openly show us the dynamics. But, through correspondence we may assess a relationship substantially. We sometimes uncover a personality through our ancestors’ journals or written accounts by others. A documented personal account of an incident, hurt or loss may give us a peek into our ancestor’s relationships. We mustn’t overlook small hints. Not all correspondence is from family jus sanguinis. Our hints to an ancestor's personality or family dynamics may come from letters written by close friends - “family of the heart.” These types of notes give us a peek at who our ancestor was to other people. They may be our only clue to an ancestor’s true personality. With present day social media the next generation genealogists will be able to capture much more. The move toward transparency and scanning of personal affects will assist in our research. The most personal depositions are beginning to appear online. I have even come across online where a person declared himself a prophet and was entangled with a church scandal. Although the dramatics are of Hollywood quality, for the genealogist the accompanying church depositions highlighted personality traits. Since church records are often the key to our genealogical research, these scanned public records should not be overlooked. Be sure to closely analyze documents, letters, church records, school records, and even employee notes for more hints to sibling and family dynamics. Newspaper articles also may reveal our ancestor’s true character. By all means, don’t assume family dynamics without assessing the evidence. Did Your Ancestor Migrate from Caribbean to Costa Rica? Although many people of African descent came to Central America and Costa Rica as early as the 16th century, historical documents trace the first English-speaking African-Caribbean family to 1828. The family of William Smith, a fisherman from Panama, migrated to the Talamanca Coast of Costa Rica (Palmer, 1977). Smith and his family settled in Cahuita in the Limón province. The latter half of the 19th Century saw a wave of Black immigrants, mostly fishermen and farmers to the eastern Caribbean coast, but even today only about 3% of the population is classified as black. If you have lost the hot trail of your Panamanian ancestor, you may wish to check the records of Costa Rica. The Panama War of Independence with Colombia, 1000 Days War, from 1899 -1902 brought a number of blacks to the Costa Rican eastern coast. From Jamaica to Costa Rica? The province of Limón is known for its large Jamaican population. Thanks to the railroad, a large number of Jamaican, Barbados and St. Kitts citizens migrated to Costa Rica for work to build the railroad line between San Jose and Puerto Limon starting as early as 1871. Some would say the Jamaicans were recruited to work on the railroad due to the belief they were “physically better to undertake the elements.” Other historians would suggest that the Costa Ricans refused to do railroad work. Either way, you may look for your early Jamaican and Caribbean ancestor in the Costa Rica genealogical records. Know that the original idea for most was to work on the railroad and return home, but due to a slump in the railroad and economy, most were forced to stay and make Costa Rica their home. Read the Jstor article: Jamaican Blacks and their Descendants in Costa Rica by Charles W. Koch (page 339). El Afro-Caribeño (The African Caribbean). As family researchers we know that employee records can be helpful in bringing down brick walls. Personnel records hold contact information, injury notes, occupation details and sometimes company newsletters hold biographies or employee announcements that may include information on our ancestors. But what if you can’t find the employee records? Did you research the company history to uncover acquisitions, corporate name changes or change in corporate ownership and culture? A good example is a recent research I conducted on the makers of Pilsen Beer of Costa Rica. Although the Pilsen beer is currently being manufactured as one of the 8 beers of Cerveceria de Costa Rica, this company (the Cerveceria de Costa Rica) is a subsidiary of the Florida Ice and Farm Company. Jamaican brothers, Lindo Morales opened the Florida Ice and Farm Co in 1908 in La Florida de Siquirres Costa Rica to make ice for banana boats coming to Limon. This explains the name “Florida Ice and Farm Company. To expand their business to include beverages, the Lindo Morales entrepreneurs acquired Traube Brewery in 1912. Jose Traube, a Dutchman, had established Traube Brewery in 1888 on the Torres River after having purchased Leona Brewery from German Guillermo Hege, who started his brewery in 1875. 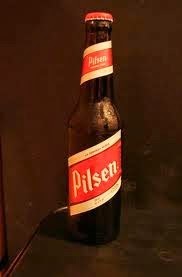 So from German, to Dutch, to Jamaican owners the Pilsen Beers makers have maintained the brewery in Costa Rica. Of course various towns and provinces have been home to the brewery and its headquarters. For the researcher looking for their beer-making ancestors, employee records may be held within repositories of any of the brewery locations based on timeframes. Records may be located in the proprietor’s personal papers; or even within diaries and accounts of employees. Deeds should be reviewed for land and company acquisition agreements. Knowledge of corporate changes may explain our ancestor’s migrations to new towns in order to follow an industry or company. A search of a town’s region may lead the researcher to discovering an ancestor’s employee. Don’t forget to peruse tax records also. For more information on the Pilsen History with Florida Ice and Farm Co review the website. Offering a Toast to your Ancestor Research.